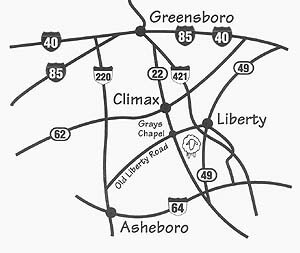 From the North (Greensboro): take Rte 421 South to the first Liberty exit. Turn right onto Old Liberty Road. Go three miles to Williams Dairy Road. Turn left. Farm entrance is at the top of the hill. or: take Rte 22 South to Grays Chapel. Turn left onto Old Liberty Road. Go three miles to Williams Dairy Road. Turn right. Farm entrance is at the top of the hill. (Winston Salem): take 40 east to 421 South to the first Liberty exit. Turn right onto Old Liberty Road. Go three miles to Williams Dairy Road. Turn left. Farm entrance is at the top of the hill. (Burlington): take 49 South into Liberty. Go straight through the first stop light. Continue straight on that road for five miles. Williams Dairy Road will be on the left. Turn left onto it. The farm entrance is at the top of the hill. From The South: take 421 North to the third Liberty exit. Turn left onto Old Liberty Road. Go three miles to Williams Dairy Road. Turn left. Farm entrance is at the top of the hill. (Asheboro): take 64 East to Rte 22 North to Grays Chapel. Turn right onto Old Liberty Road. Go three miles to Williams Dairy Road. Turn right. The farm entrance is at the top of the hill.